We are passionately engaged in providing optimum quality gamut of Conveyor Belt Fastener. 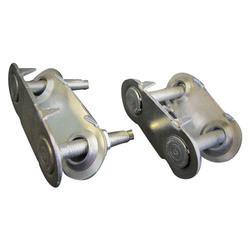 Manco Natural Stainless Steel Conveyor Belt Fasteners, Size: 2"
We the increasing demands of the customers, we are into providing a wide variety of Belt Fastener to the valued customers. The offered Belt Fasteners are available in compact design and sizes. Moreover, these Belt Fasteners are light in weight and are very simple to install. Our best quality of Belt Fasteners is accurately designed utilizing superior quality inputs and is high in demand. By keeping track of the current market needs, we are engaged in manufacturing an extensive range of Conveyor Belt Fastener. Being one of the trusted firms in the industry, we are highly engaged in providing a unique range of KTG Conveyor Fastener. When conveyor belt is working, safety is paramount, so don't put you or your workers at risk anymore. Using our Super Grip Belt Fasteners you can rest assure a tight joint to clamp the conveyor belt ends to form a continuous loop & get the safer atmosphere to work. Quantity Per Pack: 10 nos. The Conveyor Belt Fastener is highly qualitative, effective and safe to use. These are durable, corrosion resistant, dimensionally accurate, easily installed on-site using portable hand or power tools.